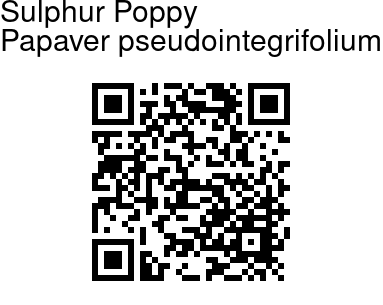 Sulphur Poppy is a monocarpic herb which can vary greatly in height, 25-120 cm tall, covered for most part in soft golden or rufous hairs, overwintering as a large bud at ground level. Flowers are large, pale lemon- or sulphur yellow, often 6-9, sometimes very few, somewhat looking down (gradually erect as flowers fade), about 20 cm across. Sepals are oval, spreading velvet-hairy. Petals are 6-8, generally spreading widely apart, oval to elliptic or elliptic-obovate, 5.5-10.5 cm. Stamens are numerous; filaments of same color as petals, thread-like; anthers yellow to orange-yellow. Flower-stalk (or flowering stem) to 45 cm, lengthening in fruit, spreading velvet-hairy to nearly hairless. Stem is sometimes present, erect, or sometimes flowers are borne in a leafless stem. When leaves are present, there is a whorl of bractlike leaves subtending flowers. Leaves are mostly concentrated into a rosette at the base, elliptic to inverted-lanceshaped, 14-40 x 2-5 cm, pinnately veined for most part, although base generally 3-veined, sometimes becoming becoming hairless above, base narrowed into leaf-stalk, margin entire; middle and upper leaves similar to basal ones but generally smaller and shortly stalked or stalkless. Ovary obovoid to ellipsoidal, densely to sparsely appressed hairy; styles distinct, 3-11 mm; stigmas rather narrow, stigmatic rays usually 7-10. Capsule obovoid to ellipsoidal, 2.5-3.5 × 0.8-1.2 cm, densely hairy to almost hairless, 7-10-valvate. 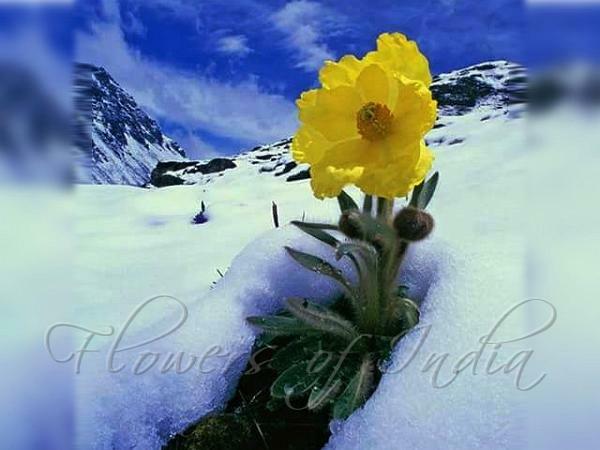 Sulphur Poppy is found in China and NE India. Flowering: June-August. Photographed in Bomdila, Arunachal Pradesh.